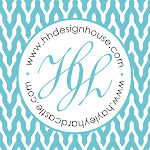 A lot has changed at HH Design House since we last posted a few months back! It's been a whirlwind, but we will try and get back into the swing of things! We have a great article and feature in the August Issue of Galveston Monthly and thought those of you beyond the circulation area might also enjoy reading what we had to share! Enjoy...and we'll be back soon! I have heard it blamed on the fact we’re Southern. Perhaps it goes back to having a name that is spelled a bit differently than people always attempt to spell it, and thus never sold prefabricated at the souvenir shops boasting everything from keychains to shotglasses with more consistently-spelled names emblazed across on each one. Or even more, maybe it stemmed from the great affinity I have for the letter “h”. At any rate and however it was arrived upon, the love of things personalized and a deep need to slap a name or monogram on everything has been a long standing fixation, and no time more-so than at present, when personalization is all the rage! Although I was the rare breed that always loved and anticipated “Back-to-School” each August, I think much of that was driven by having all new school supplies; The perfect excuse to stamp my moniker on new bags, notebooks, and writing instruments. As the personalization craze has heated up over the last few years, nothing is safe! Seeing people personalize their dishes, towels, sheets, flip flops, tumblers, bags, clothing, phones, laptops and cars has become so commonplace, that I rarely even take a second-glance when I see monogrammed and personalized gear for our four-legged friends. Yes indeed, even my dog has a custom drinking bowl with her name, and a bed with her monogram! In the last five years in the social correspondence industry, I have been asked many questions in regards to personalization and the etiquette involved. There are times a certain monogram style is more appropriate than others and times when a name or surname might be best. Is your head spinning from the name-game? I’ll try and briefly answer a few common questions we field. The answer is BOTH! If you are going to spend the time and money to get an item personalized, go all the way. It is truly so special to have something with your full name – it’s one-of-a-kind! We do a lot of stationery that has a monogram on the face or top center, and then the name beneath. This format works well for both men and women, and nearly any age. Monograms are a prerequisite on Birth Announcements, a huge trend in Weddings, and a staple in any seasoned writer’s paper trousseau. 2. What is the composition of a three initial (traditional) monogram? There are two times you would use a three-initial monogram: for an individual or married couple sharing a last name. First off, the individual monogram is anchored in center by the Family surname (or ‘lastname’) flanked by the first-name initial to the left and the middle initial to the right. For example, “Mary Jo Schroeder” would read “M S J” often with the middle initial larger or more detailed. Secondly, for a married couple sharing a last name, it is once again anchored with the surname initial in the center, and the initials of the husband and wife flanking either side. For Wedding Receptions, often the wife’s initial is to the left and the husbands is to the right (think of standing at the altar), while later in life it tends to be the husband’s initial first on the left with the wife on the right. This is a matter of personal preference though, and if the three letters spell something one way, by all means try it the other! 3. I want to use a monogram on my Wedding Invitation. What is proper? This is one of the most common questions I receive planning Brides’ Wedding Stationery. Most traditionally, the Bride’s family always hosted a Wedding, so it was her family’s crest or her own monogram at the top of the formal invitation. This has waned in popularity as it has been more commonly acceptable to use a single initial, a duogram, or even a three initial monogram for the more progressive bride. A single initial is the perfect choice when something is symbolic of an entire family (like glassware or a Christmas Card) and using a three initial monogram would only symbolize an individual or married couple. A Traditional Monogram is three initials – the surname in the center and two names on the side. You may only use this style if you are an individual who has a middle name or a married couple sharing a last name. So what on earth to do if you have no middle name, are not yet married, or are married but have different last names??? Enter, the “duogram.” Duo meaning two, this is a monogram comprised of only two initials; for individuals usually the first and last name and for couples with different last names (whether married or engaged) it is generally the two initials of the first names. This was the perfect design solution for both my wedding ensemble, not wanting to use our married monogram before we were, and also my business logo. 5. How do I write out names? 6. What are your favorite personalized items? I am a HUGE sucker for personalized stationery and notepads! Most everything on my desk has either my name or the store’s name on it. I also love the initial charms by Stella & Dot so you can make your own necklace and tell a unique story by the letters, birthstones, and sentiment charms you select. I am also loving our newest offering right now, our custom luggage and bag tags! We have tons of cute patterns and designs and they are so simple to pop on a backpapck, gym tote or lunchbox! Our Styrofoam cups and napkins are always some of our best-sellers as well! Love the article! Great advice about things you must deal with daily. I think Matt and I need more monograms around the house!